If you have a free, sunny day, I heartily recommend that you use it by going to the northern Antrim coast. Myself and two friends did so recently, and I had an unexpectedly good time. 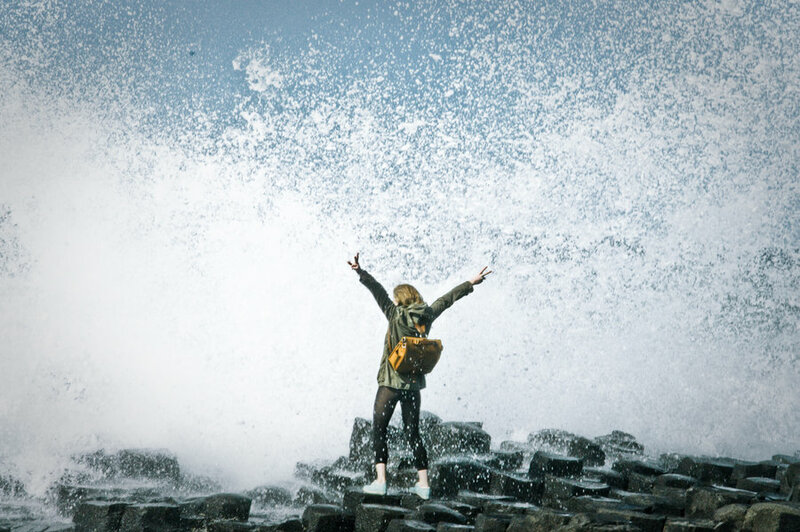 Not that I had low expectations regarding Antrim at large – it’s just that we were headed for the Giant’s Causeway, and I had heard from multiple people that it was a bit of a letdown. “It’s one of those places where you get out of the car, look, and say ‘Yep, that looks like the photo.’” “It takes ages to get to and then isn’t anything special.” So on my to do list for the year, the Giant’s Causeway had a “(? )” next to it, and I wasn’t planning on going out of my way to get there. Well thank goodness I had the opportunity to tag along when someone else planned a day trip there so that he could check it off of his own list. (He’s trying to work his way through that “1000 Places to See before You Die” book.) It was absolutely breathtaking: I was overwhelmed. We were, admittedly, a bit taken aback by the £8.50 “visitor experience” fee. We could have avoided it by leaving our car just on the side of the road somewhere rather than in the official car park (tiled oh-so-cleverly with hexagon tiles like the basalt columns!) and forsaking the audio guides we were offered – something that may, in hindsight, have been worth it, for rather than giving the detailed-but-digestible geological information about what I was seeing that I’d hoped for, the guide mainly told dumbed-down versions of local folklore and tried to pick a sweet nickname for himself. We stopped listening halfway through and just looked instead. I was expecting the cool, eerie, polygonal stone pillars rising from the sea, but not the dramatic cliffs as the backdrop and other enormous stones in the water and along the shore. There was so much to look at, not least of all being the ocean itself. I don’t think I’ve ever been on a beach that faces due North, always East or West – I was looking out onto a horizon I had never faced before, which in itself made the trip worth it. Scrambling around on the rocks (at our own risk, as per the safety signs) felt like something I’d never have been allowed to do were this place in the U.S., and I must admit my heart was in my mouth when my two friends stepped all the way out to the very edge and egged one another on to jump to the next outcrop in between ocean swells. I appreciated different parts of the Giant’s Causeway with different senses of scale. For example, I was captivated by old coins that I noticed were stuffed in between the columns, un-budge-able and warped and discolored with age and sea air. Wishes from decades past, there for the ages? And yet, from the path we followed that took us up to the top of the cliffs, those unusual rocks didn’t look impressive at all; it was the spectacular coastline, topped with flat fields that rippled back into low hills that held my eye. What a place – go, if you can. Though this had all been plenty of food for the soul, we decided to get some drink in as well and raced to the last tour of the day at the nearby Old Bushmills Distillery, as per the recommendation of a particularly friendly Visitors’ Center worker. (Which makes me a little less peeved about the £8.50, upon reflection.) I’ve been on the Guinness and Jameson tours as well, and despite the strong recommendations we had for Bushmills, I have to say I liked those other ones better. Call me an American, but I just enjoyed the flash and exhibitionism of the Guinness and Jameson tours more. We rounded out the day, as one does in any solid day of Irish sightseeing, with a good castle. Dunluce Castle near Portrush is exactly what your imagination (or my imagination anyway) conjures up when you think of a Medieval, European castle. Then perch that on top of a staggeringly dramatic cliff and surround it with green fields and beautiful oceanic vistas. We had it basically to ourselves and walked into the heart of it to look up and marvel. It was extremely satisfying. It was a long and dark drive home full of wrong turns and miscounting the exits on roundabouts (the driver had forgotten his glasses and was instead wearing prescription sunglasses) but I have to say, I’m ever so glad I went. I’ve seen a few of those “Visit Northern Ireland” posters since returning, and I must say – I agree!